"Thoroughbreds are too high-strung." "Thoroughbreds have horrible habits from being in so many places." "Thoroughbreds are too big and can't make tight turns." Those quotes are just a sample that riders of off-track Thoroughbreds have heard while revealing their mounts' former lives. But those who know the truth about riding OTTBs are trying to change that perception of the breed and show off what their horses can do in their sport. "I feel the biggest misconception is that (Thoroughbreds) are only good for running at the track," said Mallory Cortes, an off-track Thoroughbred owner who competes in barrel racing. "I feel that the only way to change the way people talk about (OTTBs) is to show them there's more to these horses." While it's very common to see off-track Thoroughbreds competing in hunter/jumper rings (where they were the dominant breed 15 years ago), eventing (their stamina and speed help them along a grueling cross country course), or any other English discipline, it's less common to see Thoroughbreds competing against their Quarter Horse rivals in Western events. "If I tell (people) my horse is a Thoroughbred, they're mostly surprised," said Ashlee Wolf, a western competitor who also works at various racetracks with her boyfriend, trainer Heath Lawrence. "And then they make comments—'he's calm' or 'he's pretty quick'—stuff like that. They don't realize that these horses are just as versatile as a Quarter Horse." With the build of the two breeds seemingly opposites—the shorter, stockier Quarter Horse versus the longer, leaner Thoroughbred—it could seem at first glance that a Thoroughbred wouldn't be competitive in western events, many of which require short bursts of speed and tighter turns than most racing ovals offer. However, OTTB competitors say with the time and patience of retraining, Thoroughbreds are able to go toe-to-toe with Quarter Horses in western events. "I love a Quarter Horse too, but I feel like you can do more with a Thoroughbred," Wolf said. "They can go longer, they're way more willing, and for the most part, they are sound and kind." Ashlee Wolf cross trains Fishinkonablue in western events when he's not at the track. Photo courtesy of Ashlee Wolf. Wolf and Cortes both participate in actively combating the stigma of using OTTBs in western events by choosing to show and retrain OTTBs. They showcase their horses' skills as page promoters for the Instagram account OTTB Western, which promotes the use of Thoroughbreds in western sports using images, features, and training tips. "Most people connect the Thoroughbred to english disciplines over western. 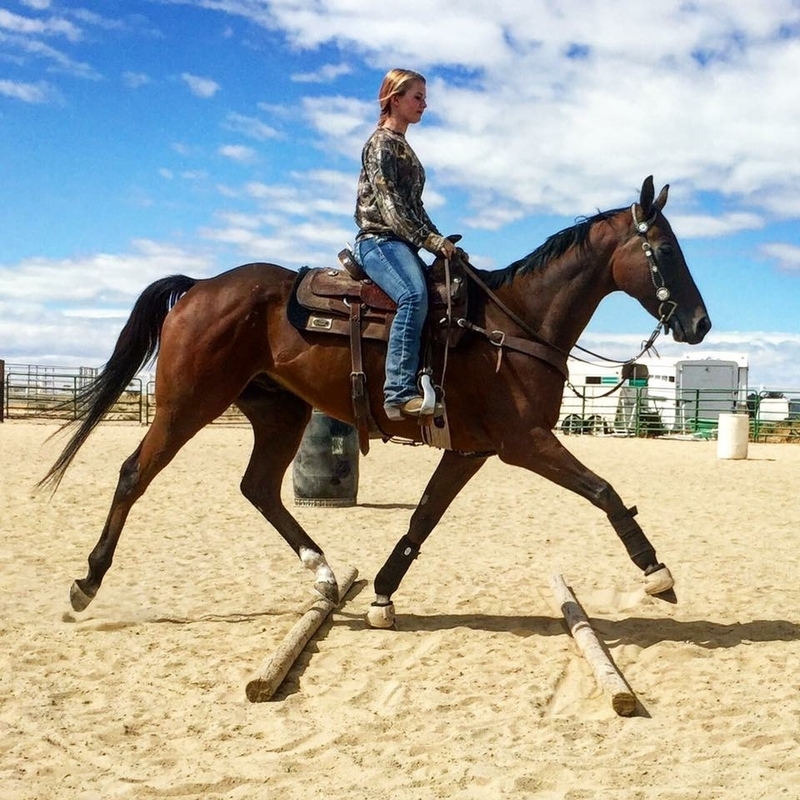 I think it's from the idea that they are high-strung, thin-framed, and not as hardy as the traditional Quarter Horse, which is far from the truth," said another page OTTB Western promoter and competitor, Kayla Zielke. "(The page) has been doing everything we can to change this perception and show the other half. These horses are capable of doing everything equally, if not better than many Quarter Horses. The more Thoroughbreds we get out in western disciplines and showing what they can do the better." And for Zielke, the breed's work ethic and "been there, done that" attitude are attractive qualities for a competition horse. "(Thoroughbreds) have an incredible work ethic," she said. "You can work them all day and they will still keep going. The nicest thing about track-broke horses is that they are so broke to everyday stuff from living at the track—bathing, farrier work, flags flapping, horses everywhere—they don't bat an eye at the chaos." "Honestly, social media is excellent," Wolf echoed about being able to show off OTTBs to a wider horse-loving audience online. 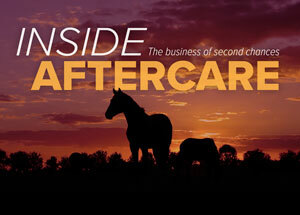 "It's so good for the whole western Thoroughbred market."